Apply for smart ration card in TNEPDS online – Here you will get to know how to apply for smart ration card in Tamil Nadu online through TNEPDS official website. These are not so different when compared to Tamil Nadu Ration card. The Tamilnadu Government has announced that the new Smart Ration cards are applied through Online in the Tamilnadu Public Distribution System (TNPDS) official website. If the people won’t have any internet infrastructure in their homes then they can visit the nearest distribution centers to apply for the new Smart Ration Card. If people with existing Ration cards or Old ration card can also be issued Smart ration card once they apply for the Smart Ration card and also can check the status of Smart Ration card. The Existing cards can be converted to Smart ration cards automatically by the Government itself. Once Old Ration card holder apply for the one, he will receive a PIN to his mobile number. This PIN will be referred and verified during issuing the new one. The card will either get delivered to Applicant’s Home address itself or he/she will have to collect it at the nearest distribution center. This article consists of How to Apply for the Smart Ration card, what is the process to apply and what are the documents are required to apply for it. The following steps will explain the procedure to apply for it. Visit the Tamilnadu’s Official TNPDS site to download the application form for Smart Ration Card. Click here https://www.tnpds.gov.in/ to directly go to the official TNEPDS website. In the home page, Click on ” Smart Card Services” section on the right column. Select “Smart Card Application” from the displayed list and you will be redirected to the Application form. Click here https://www.tnpds.gov.in/pages/registeracard/register-a-card.xhtml to register for the Ration card. Fill up the Application with the actual details and genuine information. In the application, the following columns will be seen in the form. The above details should be filled and a proper passport sized photograph should be uploaded to the site. The uploaded image should be of the size not more than 10 KB and should be in png/gif/jpeg/jpg formats. If you don’t have any files available, then you can be able to capture the picture with your system inbuilt camera. 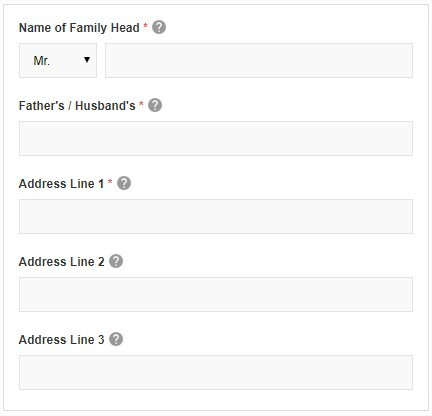 The above details in the application form are followed by the Details of Family members such as Name of the member, Gender, Date of birth etc. After fill in all the details needed and required, you have to upload the proof documents of your residence address and Identity card of Family head. Every requisite document should be uploaded which will support to verify the details of the Family member of Household. 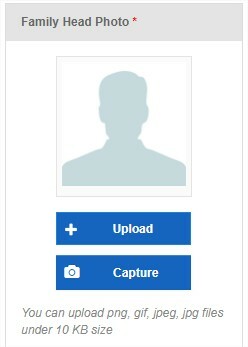 If you have the soft copies of the proof documents the upload it directly to the website, If not then scan the needed documents and then upload it to the PDS portal. The following is the list of proof documents that can be uploaded and attached to the application form by an applicant. These documents are further used by the officials to verify the details mentioned by the applicant in his/her application form. Family member details and address proofs. Income and Age of Head of the family proofs. These can be uploaded to the website as attachments or can be given in the nearest Public Distribution System office by the applicant himself/herself. If the upload of the documents is completed then check on the “Declaration” in the below of the application form and then press “Submit“. After then your application form will be added to TNPDS website. You will be given a reference number after submission which is further used to track the status of the application form and Smart Ration card. After applying for the ration card it will generally take from 15-20 days to issue the applicant with a new Smart Ration card. The card can be either delivered to the Applicant’s address as mentioned in the application form or can be collected at the nearest TNEPDS office or Ration card office. Ration card correction can be done through Online. How to Add a name to your Ration card. How to apply for a Digital Ration card online.